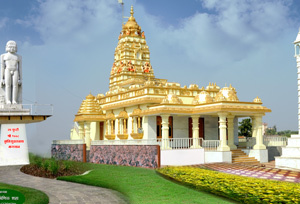 The Shantinath Jain Teerth is also called the Shri 1008 Shantinath Digambar Jain Mandir. This is situated in the state of Maharashtra in the town of Indapur, which is located in the district of Pune. It is also popularly called the Golden Temple because of its attractive and imposing golden façade. It is a major pilgrimage site for Jain devotees from around the world due to the main idol which is of Munisuvrata Bhagwan, who was the 20th Thirthankara of the Jain faith. This idol is made of granite and is 27 feet in height. The height of the temple shikhar itself is 31 feet. The Shantinath Jain Teerth temple is one of the few Jain temples in North India which is built by following a South Indian temple architecture pattern. The shape of the shikar is quadrangular and is golden in colour. The temple has three main vedis, or shrines where the idols are kept. The vedis in this temple aremade of rich marble. They are adorned with sculptures and intricate carvings that depict the events surrounding the birth of the Thirthankara. Apart from the statue of the Munisuvrata Bhagwan , there are also statues of his spirit protectors, the Yaksha and the Yakshini, as well as that of the Goddess Saraswati. The height of the 27-feet idol is similar to that of Shravana Belagola in Karnataka state in the south of India. This is made of granite with a base of 20 feet and is a major attraction of the temple. Weighing 20 tonnes and taking two years to complete under the craftsmanship of artists from Rajasthan, the idol is a must see in this holy shrine. Two main festivals are celebrated in this temple, namely Rathotsava and the Mahamastakabhisheka festivals. This temple, which was established more recently, in the year 2011, has quickly become one of the most loved Jain temples in the world.